We all know what Siberia means. It means Lake Baikal and the Altai Mountains. It means bears, long winters and vast expanses of taiga. All true enough. 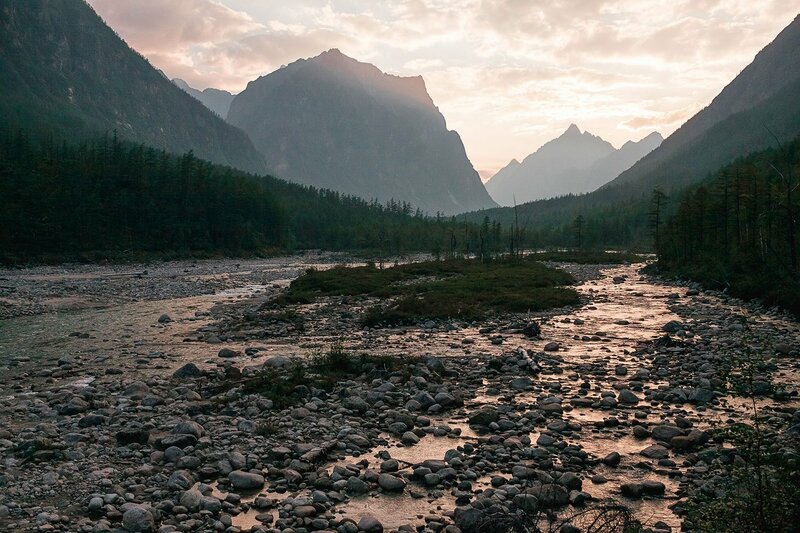 But if you scrutinise the map of Siberia, choose a little-known region and pluck up the courage to undertake an unconventional itinerary, you’ll have the chance to experience a Siberia at once recognisable and unanticipated. Some friends and I set off from Krasnoyarsk to the Trans-Baikal region on the Baikal-Amur Mainline, eager to see the Chara Sands desert and the harsh Kodar Mountains, home to numerous glaciers and an abandoned Gulag camp. 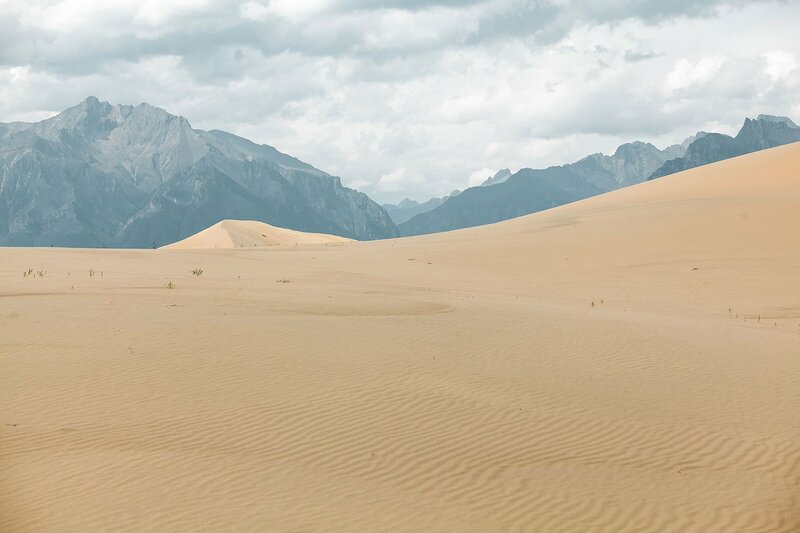 Our 10-day journey through desert, taiga and mountain gave us a taste of a terra incognita that remains virtually unknown across Russia and even within Siberia itself. Our ZIL lurched from side to side: the rough road to Chara Sands was all mud and puddles, kicked up into turbid waves by the slow-moving vehicle. The stench of petrol and iron invaded our nostrils, and looking out the window had become a perilous activity, with larch branches poking into the interior of the vehicle. 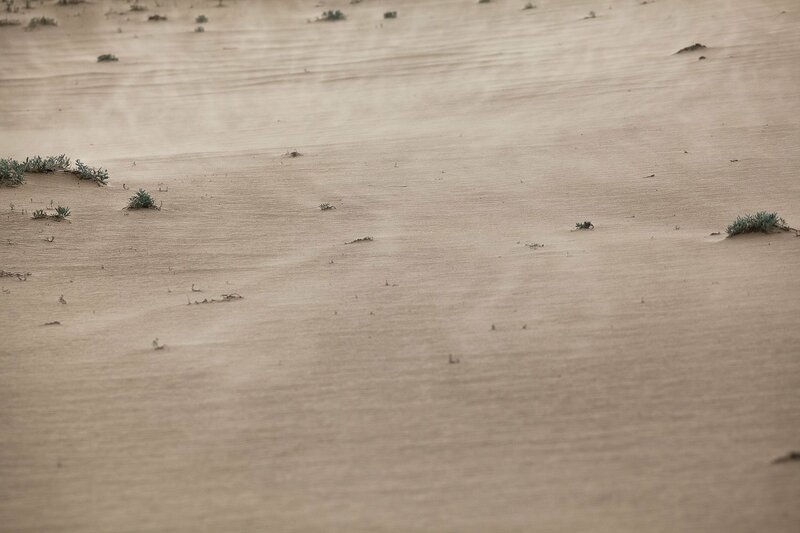 Nothing remotely resembling a desert appeared before us for a long time. We had to negotiate a river and thickets of bog bilberries before any sand materialised under our feet. The Chara Sands don’t conform to the habitual stereotype of a desert environment. 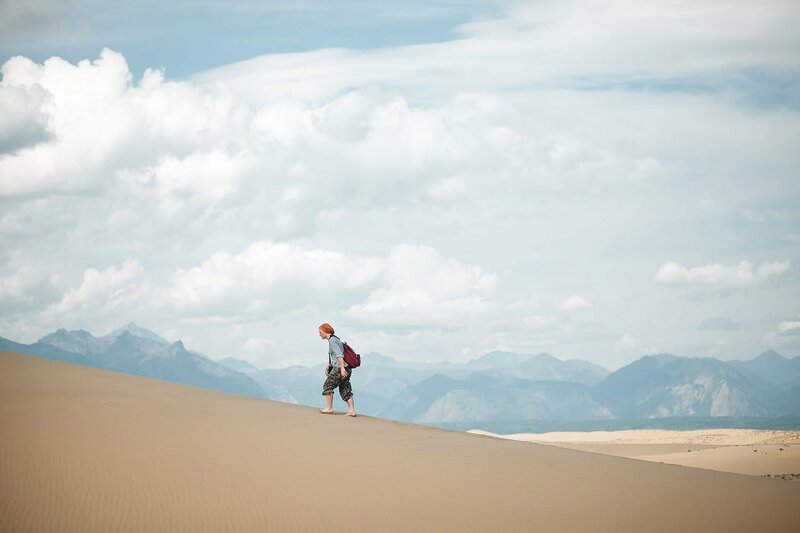 On one hand, the sensation of wading ankle-deep in its warm sands is akin to biting into a Kara-Kum candy or finding a postcard from Africa in your mailbox. 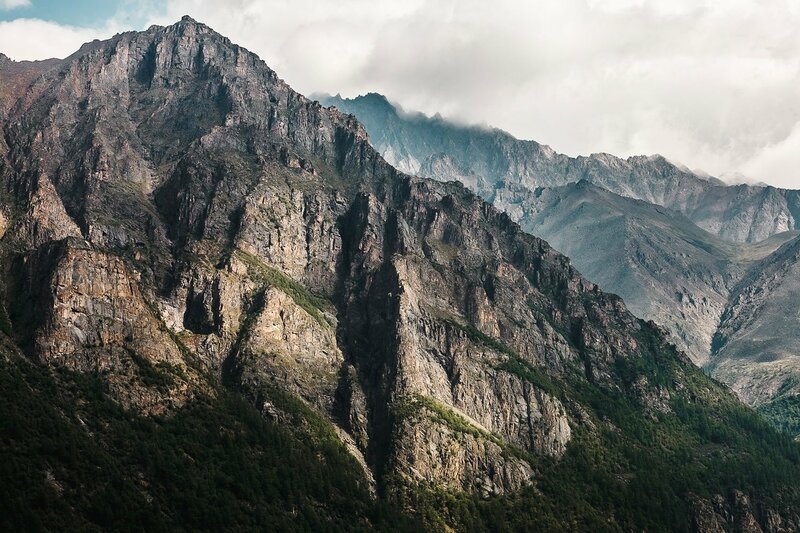 On the other, you’re surrounded by larches, the air is fragrant with the scent of fir needles, pine cones lie underfoot – and there’s a 360-degree view of the Kodar Mountains to top it all off. It’s as if someone has accidentally poured a fistful of granulated Africa right in the middle of the Siberian taiga. Ten kilometres long and five wide, the desert metamorphoses abruptly into forest at its edges. A steep descent down a sand dune that slips away under your feet, and you find yourself in a taiga oasis with impenetrable thickets of dwarf birch and larch. Sometimes, these copses feature swamps punctuated by leafless trees. There’s water here: nourishing the roots of sparsely growing plants, it prevents the Chara Sands from turning into a sterile wasteland. 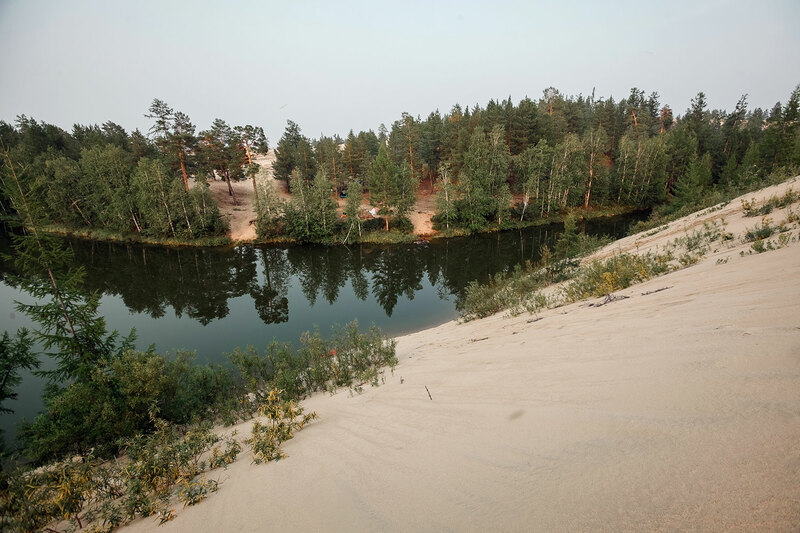 At one point in our trip, we happened across some geologists from Yakutia who told us that, thousands of years ago, the border between the sands and the taiga was one between a moraine and an ancient lake. Back then, the peaks of the Kodars lay hidden underneath a glacier. 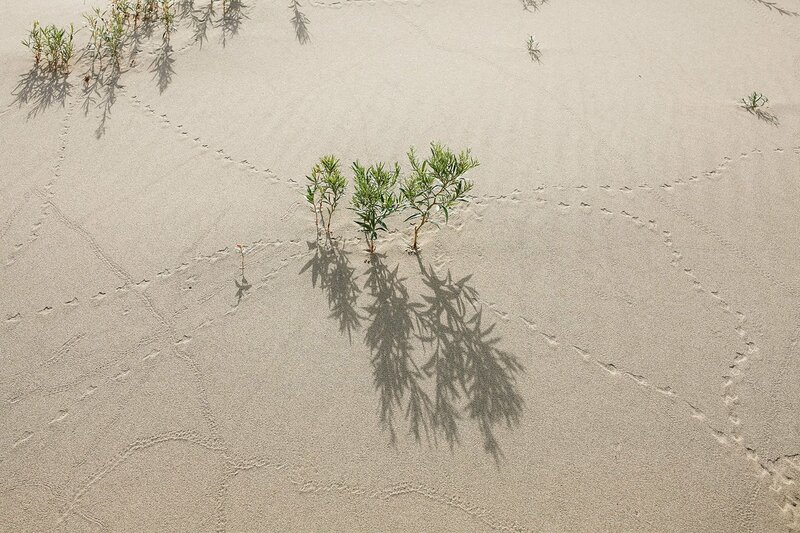 Animals are few and far between here – you might encounter fox trails or roe tracks, but only rarely. From time to time, though, the desert is frequented by bears. The year of our trip, southern Yakutia and the Trans-Baikal region were ravaged by forest fires that drove these magnificent beasts from the depths of the taiga and into the vicinity of humans. Local residents said they’d seen a bear close to the village of Chara. “Of course, he could be somewhere in the sands!” a shop assistant confidently proclaimed as I was buying firecrackers at the local store. Standing on the edge of this strange desert, we’d shout into the taiga oases in an effort to disturb the solitude of any bears lurking in their depths, and to give the animals due warning: “We’re here, don’t approach!” It felt crazy to be yelling when even the faint hum of a mosquito rang loud and clear in the silence. 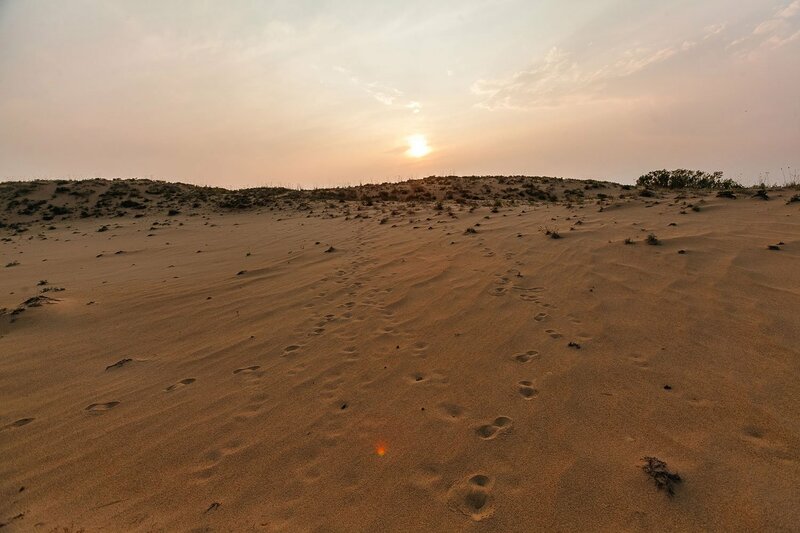 The Chara Sands are, in fact, criss-crossed by a variety of trails and tracks. Imprints of ridge-soled boots and bare feet intersect with the tiny trails of beetles, grasshoppers and birds, creating an ephemeral record of comings and goings that the merest gust of wind suffices to obliterate. 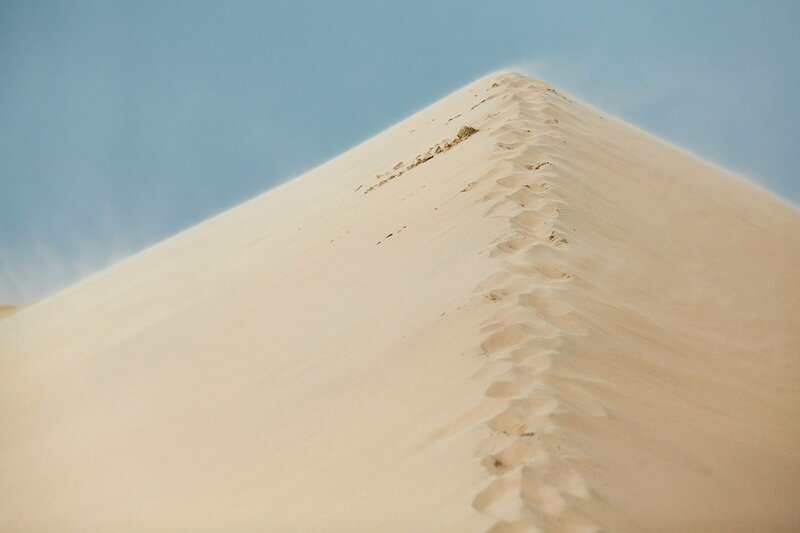 The wind determines the sand’s density: certain areas of the desert are sculptured and firm, with trails thereabouts virtually invisible, while others remain soft. 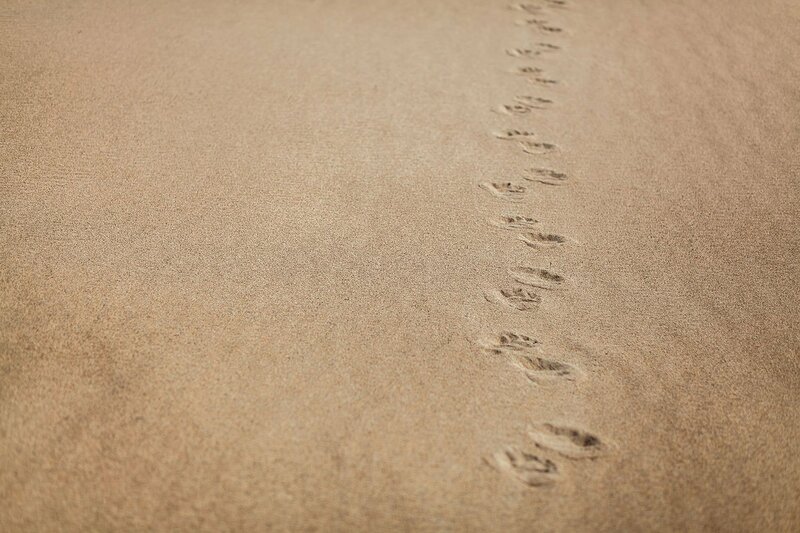 On sunny days, the sand can get too hot for barefoot walking. The deeper you penetrate into the interior of Chara Sands, the more desert you get. The islands of light green moss and pine cones grow more infrequent, progressively ousted by sandy expanses and lofty barkhan dunes hidden behind one other like immobile ocean waves. 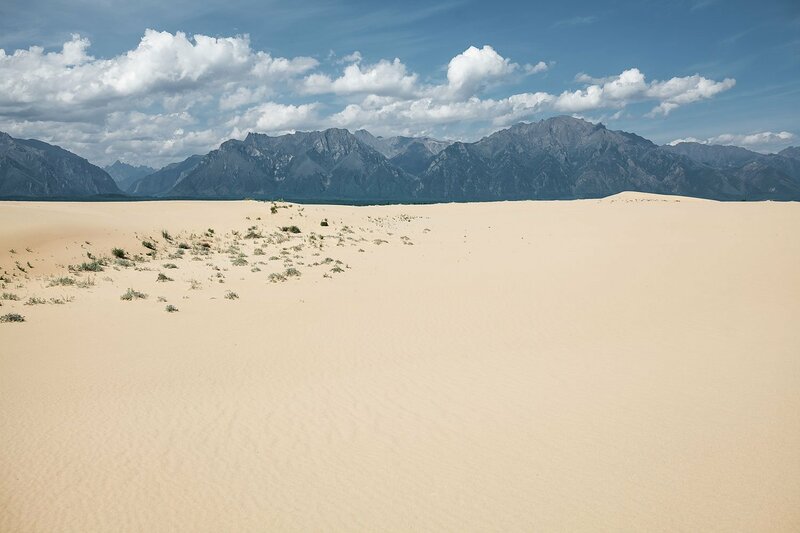 The ridges of these dunes, some of them up to 80 metres tall, are devoid of any vegetation, it being impossible for plant roots to reach water through such a deep layer of sand. 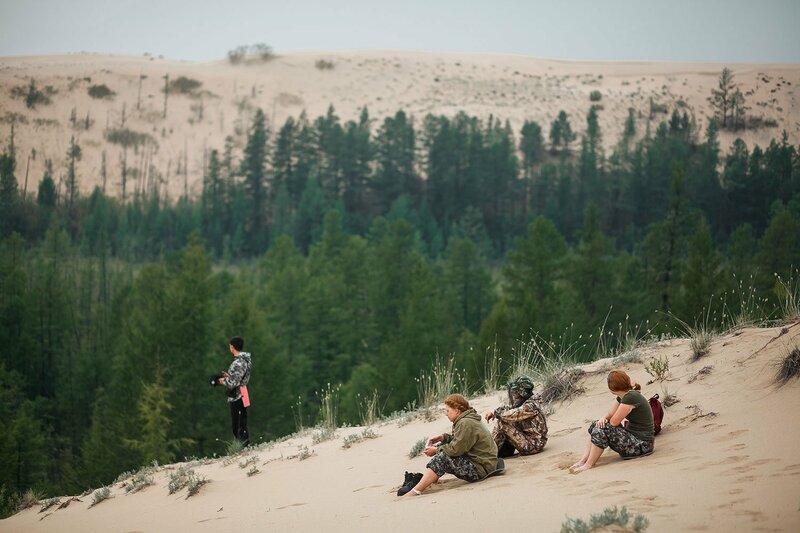 Yes, the familiar environment of Siberia remains within close reach: the whining mosquitos, the blue mountains in the distance, the larches clustered at the foot of the dunes all testify to that fact. Yet the barkhan-warmed body feels something altogether different. 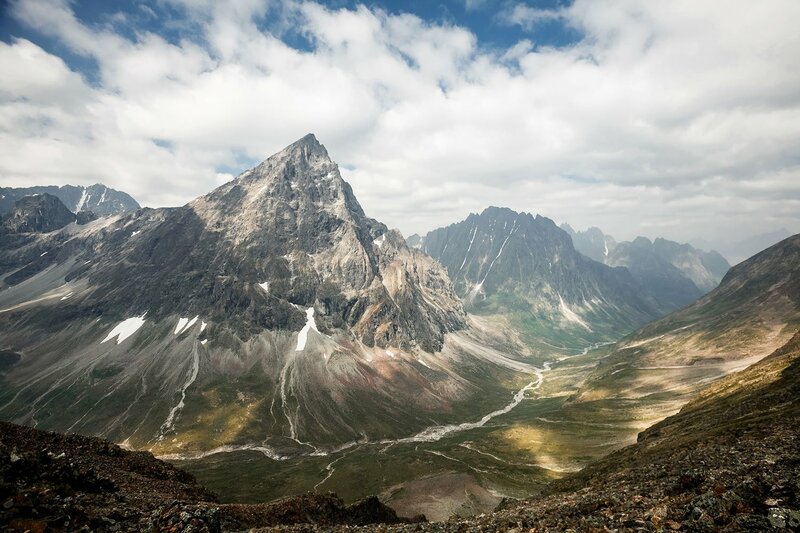 Stretching from the south-west to the north-east over a distance of some 250 kilometres, the Kodars may be gloomy and inhospitable, yet this mountain range, formed almost 60 million years ago, is also among the most beautiful in Siberia. 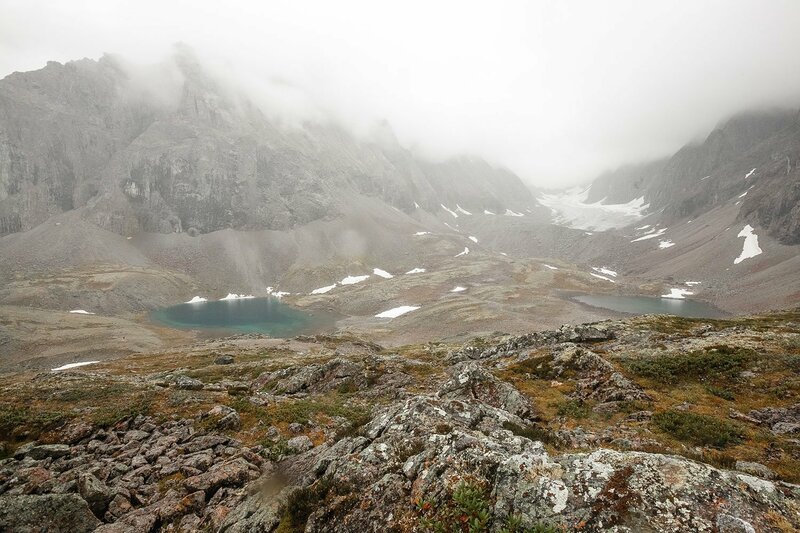 The ancient glaciers left behind a great number of cirques, mountain valleys and gorges. One of them is home to the Marble Spring, a branch of the Borsky Correctional Labour Camp whose inmates were used to mine uranium in the mid-20th century. The Kodars loom so large over the desert you’d think they were no more than a half-hour jaunt away, yet the journey to the Marble Spring site is a three-day trek taking in rivers, bogs, forests and rocky embankments. The long road stretching from Chara Sands to the Marble Gorge in the Kodars is nothing like the wild paths usually trodden by tourists. Glance to the side and there, emerging through the bog, are areas of decked pathways, several logs thick. Proceeding for a couple of kilometres along the Sredny Sakukan River, we came across mountain streams spanned by half-ruined, overgrown, roughly hewn wooden bridges. The outlines of a thoroughfare were discernible under a thick layer of moss and grass. This is the so-called Stalin Road – a sliver of Soviet history that ought to have been confined to the secret archives of the USSR but remains inscribed into the land, its reality palpable through the soles of your walking boots. Marble Gorge served as the site of the aforementioned Marble Key between 1949 and 1951 – a period during which the country, caught in the grip of the nuclear arms race, sought out undeveloped uranium deposits to create atomic bombs. 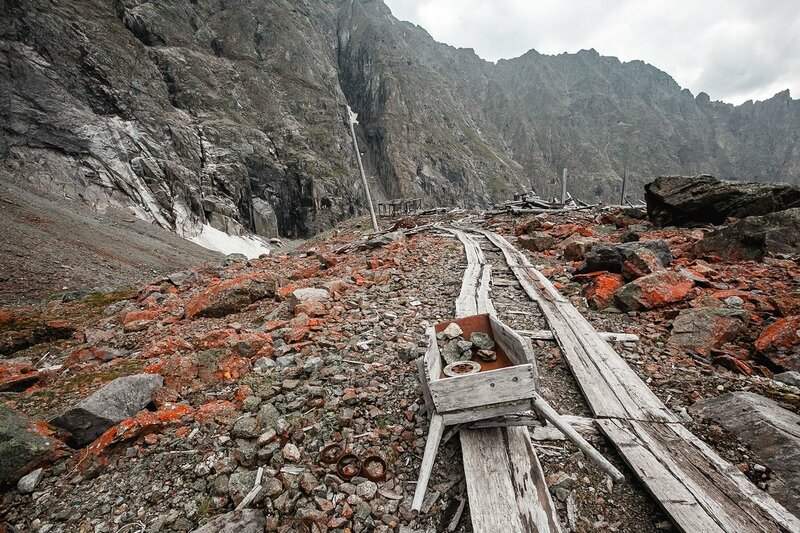 The overgrown track is a relic of an era when prisoners laid winter roads across these northern areas, constructed camp settlements, prison zones and helipads, and worked as timbermen. They suffered from frostbite and malnutrition, slept on the floor, washed themselves with snow, and, in the absence of regular showers, became riddled with lice. 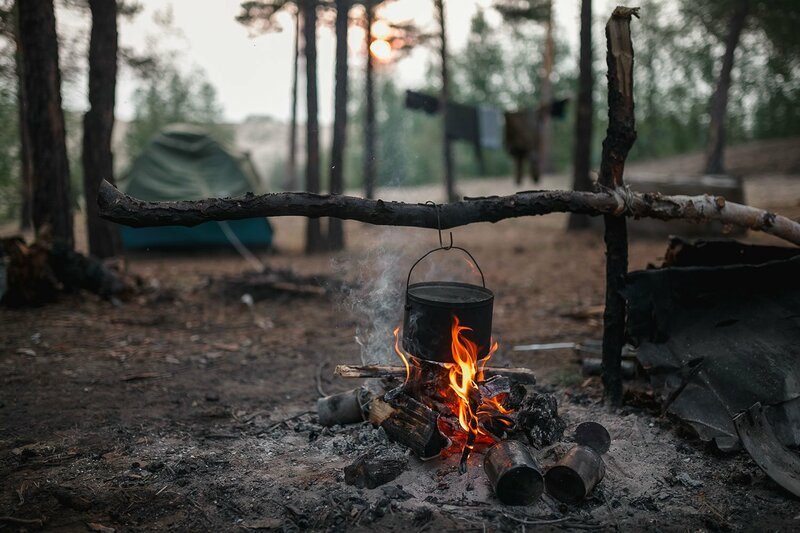 It is thought that a total of 3,735 people passed through the Borsky camp system. 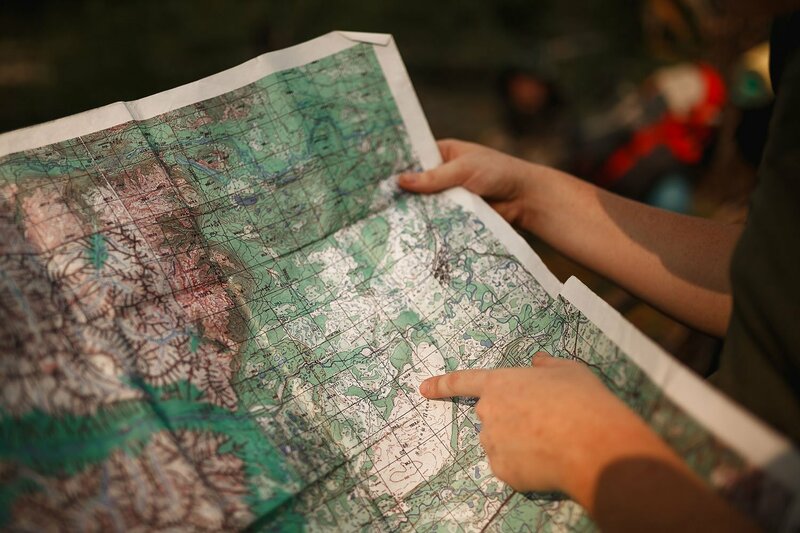 As we advanced towards Marble Key, I consulted my Soviet-era map of the Kodars, where the camp is marked as an “uninhabited geologists’ settlement”. The very existence of the deposit was highly classified at the time, with even official documents referring to uranium as “lead”, “product A-9” or “albite”. The isolated deposit site had an address that revealed nothing of its true nature: “PO Box 81”. We arrived at the “geologists’ settlement” in the morning, the sun hanging in the sky like a dirty yellow plate. The bushes were heavy with cold dew. 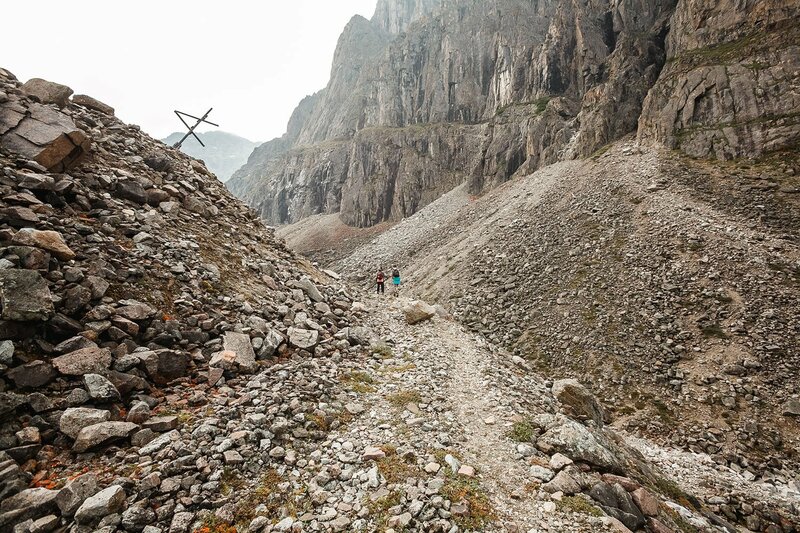 At times, the track vanished altogether among huge boulders and densely growing trees. How was it possible to build anything here? But we climbed still higher – and soon we could see the lopsided poles of the old power line, now lacking any wires. The Marble Key ruins lie at an altitude of 2,000 metres. The surrounding environment is all sheer rock walls and steep stone screes. There’s moss and grass, but bushes are rare – little of substance grows above the forest line. The gorge is dotted with long, larch-beamed barrack buildings, a lopsided watchtower, and wooden barn-like structures. 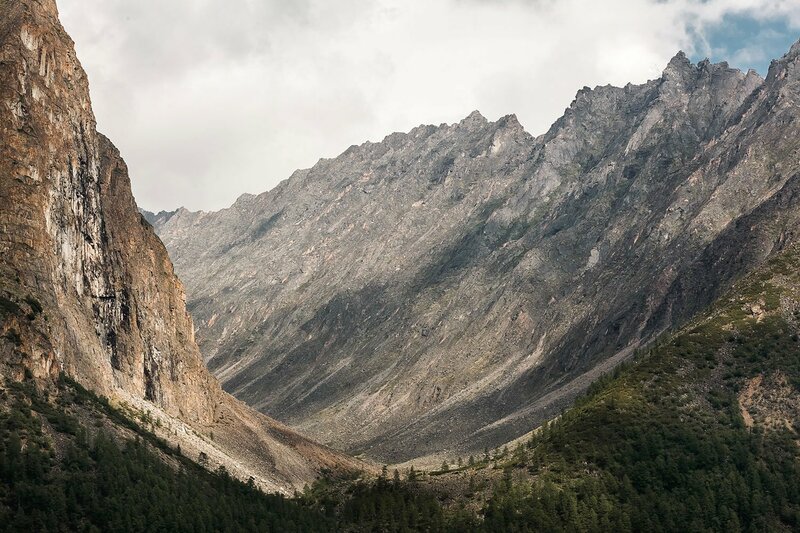 Some of them have been reduced to piles of logs by rockfalls and avalanches; some, however, look sturdy and strong, almost making you believe you could put some windows in, patch up the roof, repair the floor and simply start living there. The barracks are empty save for growths of moss and shards of window glass. Camp detritus litters the site: rusty saws, meat mincers, spanners, plates, buckets, nails, shovels. 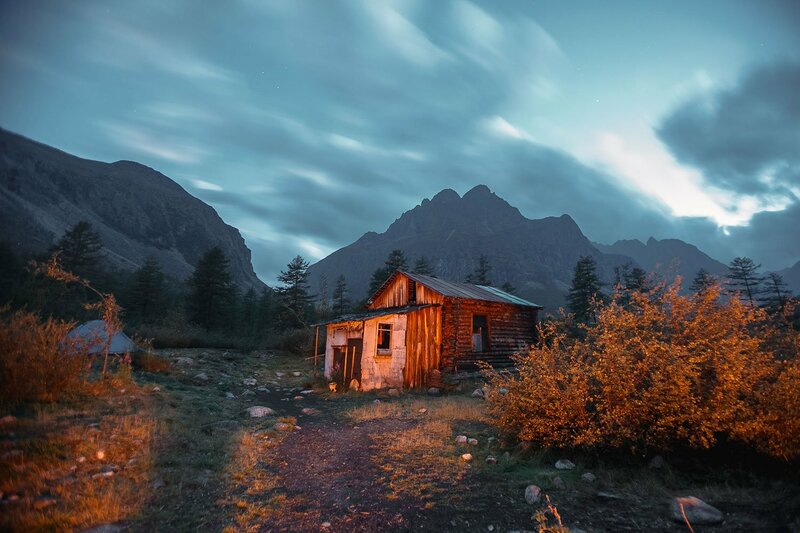 Meanwhile, the rarest and most noteworthy objects to have been found here – fragments of porcelain dishes, a Browning pistol, a surveillance peephole, a device for casting canister shot, a carbide lamp, crampons, snuffboxes – are now housed in the regional museum in Novaya Chara. How did camp inmates, who would spend several years labouring in this gorge, manage to survive here, and what did they think about? Answering this question is next to impossible – very few human histories have come down to us. We’ve only the facts behind which these histories are hidden. 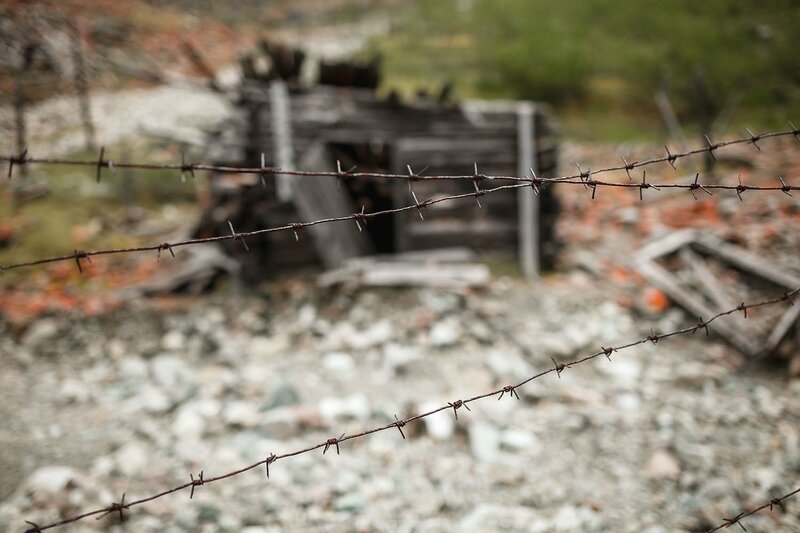 It’s been established, for example, that more people escaped from the Marble Gorge camp than from the other camps in the Borsky system: 44 individuals in total. That there were seven bayans, two accordions, 15 guitars and 50 domino sets in the camp. And that, on occasion, letters sent there failed to reach their addressees. “Prisoner Abdulazimov hasn’t received any letters from his family for over a year because the letters he is sent are written in Chechen. The censor here cannot read them,” states one of the camp reports. This cold stony environment, exposure to which makes for an experience at once fascinating and eerie, strange and unsettling, resembles neither an open-air museum nor a memorial complex nor yet a former Soviet camp. It’s all uncannily reminiscent of a video game where a lonely protagonist wanders through a grey, abandoned city, doing his utmost to find something – anything – still living. It soon transpired that the quantity of uranium at the Kodar site was insufficient to create an atomic bomb, and the region’s camps began to be liquidated in 1951. Some of the prisoners – a little over 700 people – were transferred to Construction Project No. 247 (Chelyabinsk-40) and Construction Project No. 16 (Kitoy Station, the East Siberian Railway). In the 1950s, the country’s leaders were scared to admit that the hopes they’d pinned on Siberian uranium were not going to materialise. But scarier still, perhaps, was the fact that prisoner Abdulazimov failed to receive any letters from his relatives for over a year. Extracts from this article were first published in Russian on Siburbia.ru. This article was produced as part of The Calvert Journal‘s New Writers Programme.